I am SUPER EXCITED about today's announcement! It is so easy to let reading time slip by during the glorious & busy having fun days of summer. As a child, I always looked forward to the summer reading list from school. My books would always be read within the first 2 weeks of summer. Yes, I am a book nerd & quite proud of it! There is nothing I enjoy more that relaxing with a good book. My girls have a fondness for books and reading and I like to think that it stems from me. I have been reading to them since they were babies. Now, we are at a stage where my Oldest Diva also reads to us nightly. It fills me with pride to listen to her read and know that I had a hand in that! We have big plans this summer to tackle some chapter books together - her idea! We will be making weekly trips to our local library and keeping track of all the books we read. She hopes to reach 100 (totally doable!). The Summer Virtual Book Club for Kids. Oh, how we LOVE Mo Willems around here! How can you join in on the fun of The Summer Virtual Book Club? 2. Do an activity together inspired by the book. 3. 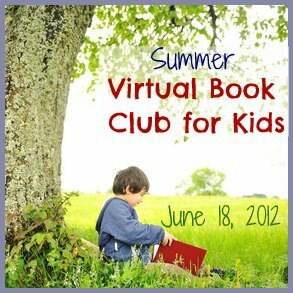 Join us here on June 18, 2012 to share which book you read & any activities you do along with it on our Summer Virtual Book Club linky. Looking forward to virtually sharing one of favorite authors with you all! I can't wait to see which book you read & what activity you do with it. This is fantastic! I have three children from middle school to second grade, two of them just got local library cards and are really excited to read. It will be great to do some online fun too! What age group will these be aimed at? Great idea. I am soooo excited about this too! !